Back cover blurb: Tim Johnson took his baby daughter out for a walk and she never made it home. Johnson claims he was assaulted and the girl was snatched. The police see a different crime, with Johnson their only suspect. A year later, Sam Bryne is on course to be elected as one of the youngest MPs in Westminster. He's tipped for the very top ... until he vanishes. Detectives Murphy and Rossi are tasked with discovering what has happened to the popular politician - and in doing so, they unearth a trail that stretches into the past, and crimes that someone is hell-bent on avenging. With every book Luca Veste writes I become more of a fan. His crime novels are realistic, gripping and at times witty - because we all need a bit of humour in our crime fiction - even if we didn't know it. Tim Johnson has recently moved from the Wirral to Liverpool to escape his partner and keep his newborn daughter safe. But when he is brutally attacked and left for dead, his baby daughter no where to be found, the police question not only his story but also his sanity. According to records, nosey neighbours and the like, there is no ex partner or baby, and Tim is suddenly the prime suspect in another crime entirely. A year later and young Liverpool politician Sam Bryne is missing without a trace. Murphy and Rossi are pulled into the investigation, Sam's parents keen on finding their son before details of his less than rosy past are leaked to the press. As they delve into Sam's private life, it seems there is much more to the politician than first meets the eye. Sam Bryne also has some unsavoury friends from university who seem reluctant to help the police with their enquiries. It is clear they are hiding something. But it's not clear what or how important it is to the investigation. Murphy and Rossi are by far the most realistic crime fiction pairing in modern crime literature. They are not afraid to make mistakes, to trust their instincts and above all fight for justice. Roll on book number 5! 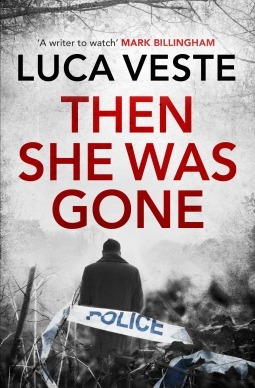 Then She Was Gone is available now via Amazon online and all good book shops.